Many people will suffer moments of stress and often feel overwhelmed when having to sit an exam. Many of us will also be able to recall how nerve-racking it can be to take a test. Weeks before the exam, we can experience the sensation of butterflies in our stomach. Our palms get sweaty, our hearts race and we fear our memory will let us down. Feeling stressed and anxious before an exam is expected and feeling nervous is a natural emotion. Lots of people will find these feelings a motivator and a way to focus on the task, but some of us will find the pressure overwhelming. When these feelings become intense, they can threaten performance. Sometimes the stress can cause a person to achieve below their true potential. Who will experience exam stress? Exam nerves can affect anyone, at any age. It doesn’t matter how much a person has revised or how much experience they have, the chances are they will still have a feeling of panic. There is a great emphasis in today’s society to use exams to measure a person’s ability (for example, to drive a car, to study or for a certain job). We may expect it, but the pressure can be overwhelming. When nerves become out of control, they can lead to anxiety attacks and stress. If a person does not know how to cope with these feelings, they can create a vicious circle of more intense emotions. Over time, this can have a negative impact on the unconscious mind and result in more general, longer term performance-based anxiety. Preparing for an exam and successfully completing it is not just about how knowledgeable you are, but also your state of mind. Feeling calm, relaxed, focused and confident when studying and sitting the exam means you will be much more likely to achieve your full potential. While accessing this state of mind is a skill, it can often be learned by implementing new ways of thinking. Hypnotherapy is a common method used for helping control exam nerves as it can help boost confidence and reduce feelings of anxiety. It can help you develop the ability to access the calm state of mind needed to sit an exam, or cope with a potentially overwhelming situation. The power of suggestion and visualisation techniques can encourage an individual to clear their racing mind and approach the exam with a cool, focused head. Your mind knows the information you need to pass the exam, but when experiencing exam stress or anxiety, your ability to focus and concentrate will suffer. Hypnotherapy will help you recall the information easily and correctly, as well as help restore your self-belief. Hypnotherapy has proven effective for many people dealing with anxiety and fear. This is why many of those suffering with exam nerves consider the idea of hypnosis as a form of treatment. While all hypnotherapists will differ in their approach, generally, the treatment will begin with an initial consultation. This is often a short telephone conversation or meeting before booking a session. The idea behind the suggestion method is that when you start to feel under pressure, overwhelmed or stressed about an upcoming exam, the suggestions and visualisations will enter your conscious mind and help you cope. You may also be taught valuable techniques that can help you relax and remain calm when you start to feel worried. Hypnotherapy can also be used to overcome fear of failure. It can encourage you to focus, believe in yourself, increase motivation and boost concentration. You may find that one session if enough to help you overcome your exam nerves and stress, or you may feel you need more. You will be able to discuss this with your hypnotherapist and work together to decide what techniques and how many sessions will be most effective for you. The hypnotherapist may also offer self-hypnosis techniques for you to practise at home. 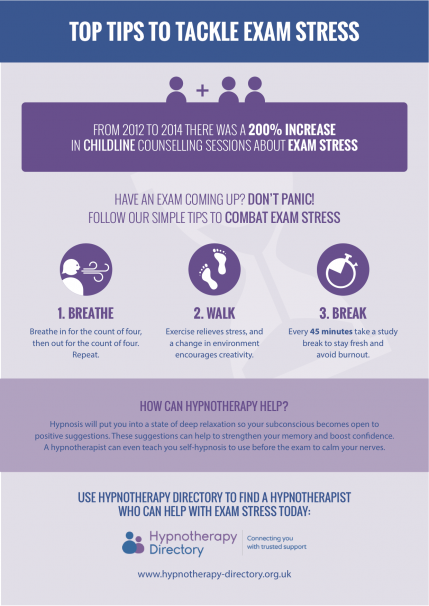 An important part of hypnotherapy for exam stress is knowing how to remain calm and relaxed, even when the pressure is building. A little bit of stress is good for us and can give us the boost we need, but too much stress can hinder our abilities. Alongside your hypnotherapy sessions and self-hypnosis techniques, it is important to remain healthy. In order for your mind and body to function properly and cope with the nerves that come with exams, you need to be well rested, continue to eat a balanced diet and remain hydrated. Stress can affect us at any point in our lives. It can sometimes appear unexpectedly, causing us to lose sleep, lose our appetite and forget to take care of ourselves. If you feel your exam stress is affecting your daily life, hypnotherapy can also be effective for sleep disorders such as insomnia, panic attacks and relaxation.